Princess Mathilde was seen wearing a beautiful 20th century diamond necklace for two major royal occasions. First at the prewedding party for the duke and duchess of Cambridge in London, on the 28th of April 2011. She wore the necklace a second time at the prewedding gala dinner for the wedding of hereditary grand duke Guillaume of Luxembourg and countess Stéphanie de Lannoy, in Luxembourg on the 19th of October 2012. 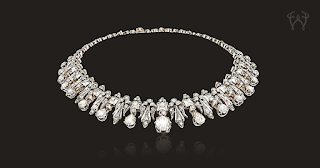 The necklace was loaned to Mathilde by Maison Wolfers from Brussels.